Madison Avenue was closed yesterday for a street market and I spotted a table with candy apples and this brilliant twist on the concept.. candy strawberries and cherries! This sounds soooo good to me! 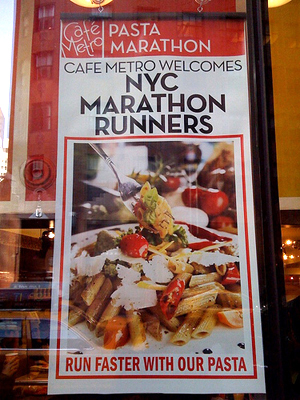 Today is the NYC Marathon and there are runners everywhere. I guess they are on the hunt for carbs. 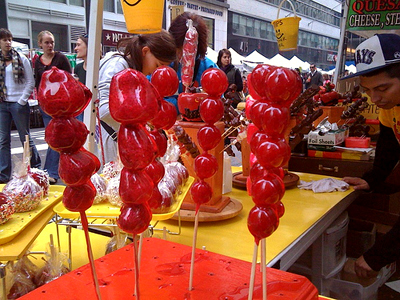 That's very similar to a Chinese treat--candied plums, little pears, and even cherry tomatoes on a stick. I heart your blog! As a former Rochester girl myself now living near the big city...I love these type of posts! I also love reading about the great new things/places in Rochester! Keep up your GREAT work!